1950 – Late 1970’s PercyHenderson played Tennis for Arorangi together with Michael Jonassen as doubles partners,during his time of playing tennis he achieved the Doubles Championship Title. Established the Rarotonga Sports Association, there after established the Cook Islands Sports Association (now known as CISNOC). Established the Cook Islands Amateur Athletics Association, Established the Cook Islands Rugby Union & Referee’s Association. 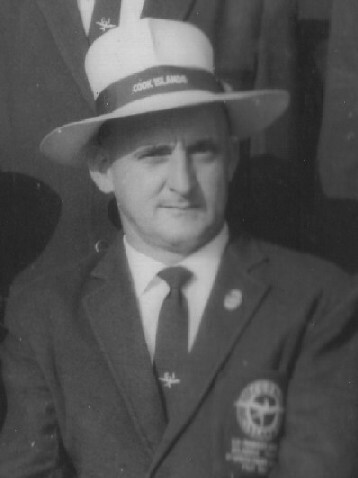 For 22 years Percy Henderson held the position of Secretary of the Cook Islands Sports Association. Percy also held the position of President for 5 years of the Cook Islands Rugby Union & Referee’s Association. Percy Henderson is a Life Member of the Rarotonga Rugby Union. For many year as a Referee for the A – Grade Division in Rugby Union. Cook Islands Delegation for Foundation Meeting that set up the inaugural South Pacific Games Council. Percy Henderson was the general Team Manager for the first Cook Islands Team to the first South Pacific Games held in Suva, Fiji 1963. He was also an Athletics Coach for the 1st and 2nd South Pacific Games. Percy was also instrumental in organising the inaugural round Rarotonga Road Race (RRRR). Percy was also instrumental in the organising of the inter-village Athletics competition, known as the “Kumete Sports”.Other Awards Received: 30th December 1989 Percy Henderson received for his contribution to Sports and Community the “order of the British Empire (OBE).